To clean the cuttlefish: wash it well under running water. Tear through the back and discard the backbone and insides, carefully separating the small silvery ink sack and setting it aside. Peel the skin from the flesh and discard. Cut the tentacles just below the eyes, squeeze the beak out from the centre of the tentacles and discard. Set the tentacles to one side. To clean the squid: basically follow the same method as the cuttlefish but tear off the two "wings" near the point. These can be eaten as well and all you need to do is peel the skin off them. Remember to set the tentacles aside with the ones from the cuttlefish. Keep all the ink sacks in a little dish on the side. Slice the cuttlefish and squid into approximate 2cm x 4cm strips. To extract the ink, break the sacks and squeeze out the paste. Add a few drops of water to make it a smooth consistency. Heat a large saucepan with the 1/3 cup olive oil over medium heat. Sauté the large chopped onion and when soft, add the sliced cuttlefish and squid, not the tentacles, and cook until lightly golden. Add the 4 cloves garlic and chopped parsley, stirring to combine. Pour in the wine, vinegar and then stir in the ink paste. Cook for a further 5 minutes. Season with salt and pepper, to taste. Add the rice to the saucepan along with an extra tablespoon of oil. Stir the rice into the seafood and sauté for 1-2 minutes. Add enough hot water to cover the rice completely, reduce heat to low and cook, uncovered, until rice is al dente. Stir occasionally. If the rice dries out before it is cooked just add small amounts of hot water each time, stirring, until cooked. Do not let it stick! In a separate small frying pan heat the extra tablespoon of oil and sauté the chopped ½ onion over medium heat until soft. Add the reserved tentacles and garlic and sauté for 1-2 minutes. Throw in a little chopped parsley and salt. 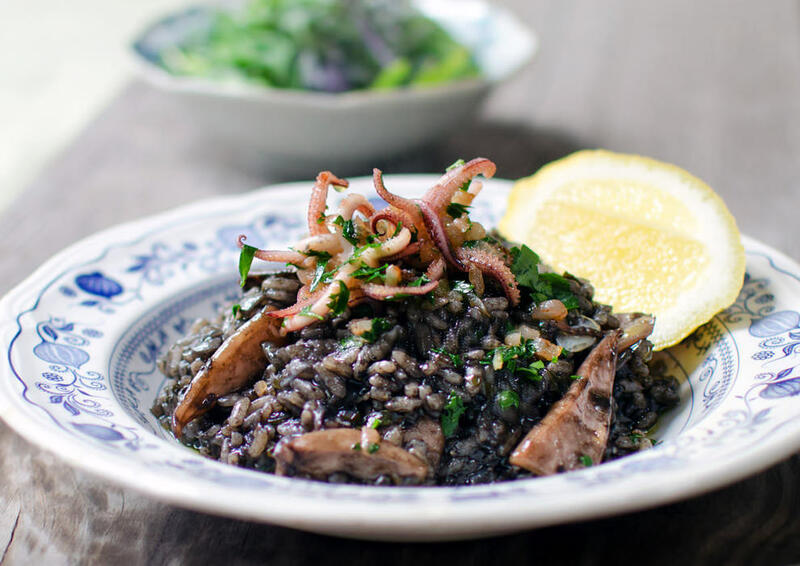 To serve, dish up the risotto in individual bowls, top with the sautéed tentacles, more parsley and a cheek of fresh lemon. A side salad of fresh leaves, glass of vino and crusty bread wouldn't go astray, either. For additional recipe details, please visit the site of our generous contributor: heneedsfood.